TerraGate suite is a family of tools designed to support all the client-server requirements of Skyline’s 3D technology. TerraGate has two components: TerraGate component and TerraGate SFS component. Streams 3D geographic data from terrain cache databases (MPT) or directly from the original sources through the DirectConnect extension. Enables the use of extended TerraExplorer Pro API capabilities from authorized domains. Hosts TerraExplorer Collaboration sessions to which multiple users can connect and work together in the 3D environment. Streams feature layers (points, lines and polygons) via the WFS server from Shape files and from the Oracle database, SQL server database, PostGIS and ArcSDE server, or from pre-cached layers created using the Cache Creator. Streams maps via the WMS server of spatially referenced data from terrain cache databases. Publishes multi-resolution and stream-optimized 3D Mesh Layers databases (3DML), to remote TerraExplorer clients. 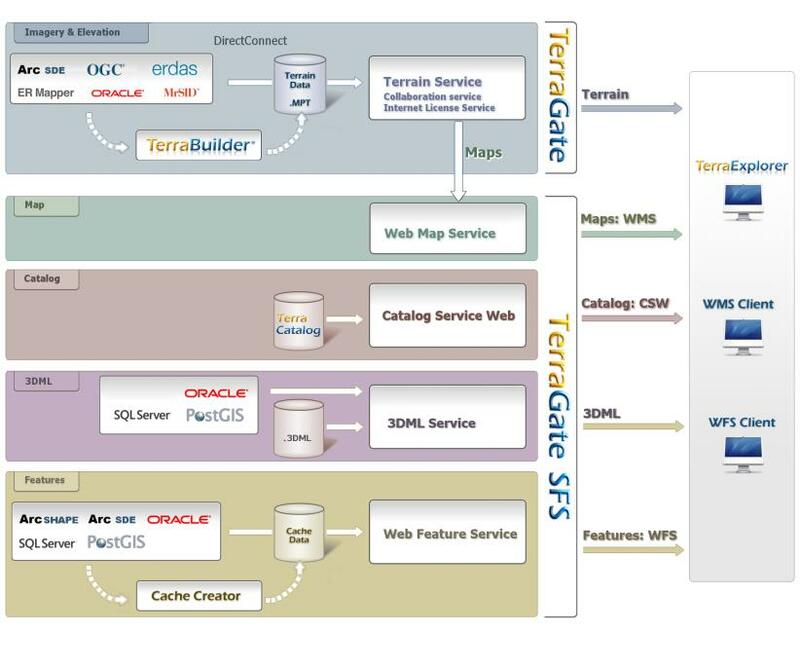 Provides web interface to TerraCatalog, a catalog database that stores, organizes and manages connections to raster, feature, and 3DML layers, located in storage files or on remote servers.